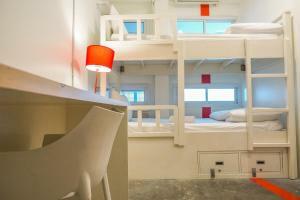 Located along the vibrant Silom Road, HQ Hostel offers trendy yet affordable accommodation. It features free wireless internet access in the lobby area and an internet cafe. HQ Hostel feature dormitory rooms that can accommodate different number of guests. The hostel provides free individual lockers and locks. The hostel’s common area has a TV showing sport and movie channels. Books and magazines are available at the library corner. HQ Hostel is 450 m away from the Saladang BTS Skytrain Station and 950 m from the Silom MRT Station. Located within walking distance are many dining and nightlife options. A damage deposit of THB 300 is required on arrival. This will be collected as a cash payment. You should be reimbursed on check-out. Your deposit will be refunded in full in cash, subject to an inspection of the property. Guests are required to show a photo identification and credit card upon check-in. Please note that all Special Requests are subject to availability and additional charges may apply. Rate: THB 385.33 ... THB 1390.00; select dates below to get current rates. Rate: THB 321.10 ... THB 1490.00; select dates below to get current rates.